The eldest of nine children of an Anglican Church minister, Edward Chad Varah was born on November 12, 1911, in the small town of Barton upon Humber, County of Lincolnshire, England. 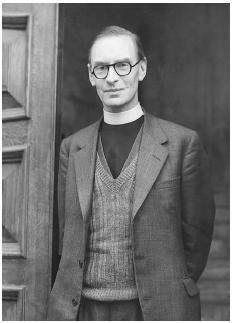 He went on to read natural sciences at Keble College in Oxford, and later studied at the Lincoln Theological College, where he was ordained as a priest by the Church of England. In the culturally repressive atmosphere of the United Kingdom in the 1930s, Varah recognized the extent to which confusion and ignorance about many social issues, several still shrouded in taboo, contributed to the despair that often led to suicide. Reverend Chad Varah founded a worldwide movement of volunteers that offers emotional support to those who are suicidal and in despair. reluctance to see a psychiatrist. He believed suicidal people needed a way of being in touch with someone to whom they could talk at any time of day or night that was right for them. The opportunity to help such people arrived when Varah was appointed rector to St. Stephen Walbrook, the London church where he founded The Samaritans, a volunteer organization dedicated to befriending those going through emotional distress. Remembering the young girl, and seeking to minister to the suicidal despair so common in a large city like London, in 1953 Varah advertised in the press and opened the first drop-in center where emotionally isolated and distressed people could go to find a sympathetic ear. • most of the visitors wanted to talk to someone who would give them time and space, who would listen in confidence with acceptance and compassion to their deepest, most anguished thoughts. To meet the huge response, Varah organized volunteers to talk with those waiting to see him. He soon observed interaction between the many and varied callers coming to talk and the lay volunteers who listened empathetically and acceptingly. He called the listening therapy "befriending." One therapeutic model in the now-multifaceted approach to suicide prevention, it is a "response to an immediate emotional crisis by lay volunteers who are given professional support by appointed medical and psychiatric consultants" (Scott and Armson 2000, p. 703). At the end of the twentieth century there are thousands of volunteers around the world dedicated to befriending the suicidal in the manner first conceived in the 1930s by the visionary Varah. Scott, Vanda. "Role of Volunteers in Preventing Suicide: A Befrienders International Perspective." Presentation at the symposium Towards an Evidence-Based Suicide Management: Linking Australia with the Rest of the World in Brisbane, Australia, 1999. Varah, Chad. Before I Die Again: The Autobiography of the Founder of Samaritans. London: Constable, 1992. Varah, Chad. The Samaritans in the 80s. London: Constable, 1980. See B EFRIENDING ; L IFE S UPPORT S YSTEM .